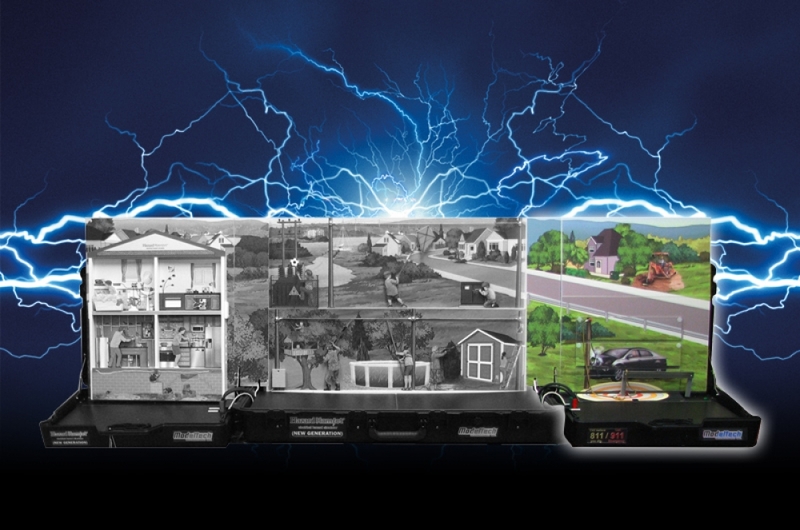 Continuing on the renewed success of the Hazard Hamlet NewGen simulator and after positive feedback from electrical utilities throughout USA & Canada, Modeltech is pleased to confirm the addition of an 811/911 module for Hazard Hamlet, making this simulator even a more complete to support your innovative electrical safety program. After 20 years and over 700 units sold, the Hazard Hamlet Energy Safety Simulator has already been completely redesigned in a “New Generation” package. Through realistic graphics, special effects and a handy remote control, this new concept provides unmatched flexibility in presenting multiple electrical hazards and improved visibility. Now, the addition of a 811/911 module adds even more teaching possibilities to the mix. Loud electrical arcs, sparks, lights and a hand-held miniature are all at your disposal to teach how to avoid hazards such as ground gradients and energized bodies. A handy illustration package provides even more teaching aids for group presentations.